In many ways, the MINI 3 Door reminds me of the Jeep Wrangler. It’s one of those halo cars that holds an entire brand together. MINI, like Jeep, has widened its portfolio of cars and SUVs in order to increase profit, normal stuff for any carmaker. In other words, if the classic three-door MINI was to depart from its basic formula, the entire brand would crumble. 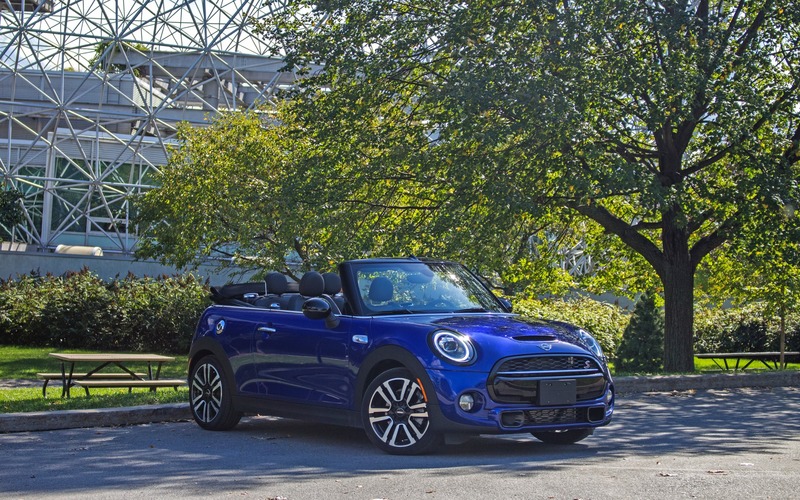 Take the car you see here, for instance, the 2019 MINI Cooper S Convertible. It doesn’t look all that different than the original MINI Cooper S that returned under the BMW administration in 2002, yet, it’s a considerably larger, and a more refined and sophisticated machine than ever before. This focus on core values is what makes this car so endearing. I personally find it funny when I see Union Jacks on MINIs because these cars aren’t exactly British anymore. They’re heavily based on BMWs. For instance, this one’s entire structure and drivetrain is shared with the BMW X1/X2 crossovers. But hey, at least the cars are put together in Cowley, Oxfordshire, in the UK, so there’s that. For 2019, that’s what you get, more flags. The taillights are now adorned with the things, and there’s one on the dashboard that lights up in the same colour as the ambient lighting. See these changes as a mid-cycle update for a car that was significantly overhauled in 2014. Other tweaks include slightly modified headlights and MINI’s new logo. Inside, there’s now a standard 6.5-inch screen with Bluetooth connectivity. 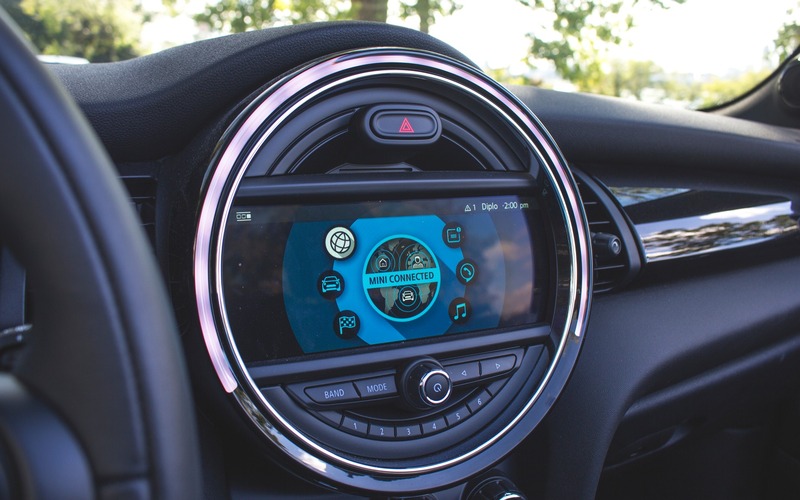 Buyers can also opt for an optional 8.8-inch touchscreen with navigation, along with Apple CarPlay integration and 4G LTE Wi-Fi connectivity. Android Auto is still not offered. As for drivetrain, everything stays intact. Base MINI three-doors come standard with a turbocharged, 1.5-litre three cylinder good for 134 horsepower. Both hardtop and convertible MINI Cooper S’ soldier on with a 2.0-litre turbocharged four that pumps out 189 horsepower and 207 lb.-ft. of torque. Both six-speed manual and automatic gearboxes remain. My tester was a Cooper S convertible equipped with the Starlight Blue Edition colour and Package, which includes 17-inch package-specific wheels, piano black exterior trim, black mirror caps, the full battalion of connectivity and navigation features, rain-sensing wipers, a Harman/Kardon sound system, leather seats and dual-zone climate control. It sells for a not-so-cheap $38,290. I admit, I have a soft spot for the MINI Cooper S. I’d personally get mine with a hardtop and a manual transmission, but even dressed up in the bubblier ragtop automatic combo, this remains a seriously fun-to-drive little thing. What I love about all MINIs is their build quality. Sure, they’re expensive cars, but they at least feel expensive, and like all BMWs, there’s a genuine sensation of solidity across the board. The doors close shut in a satisfactory “thump.” The chassis is stiff, and the 2.0-litre turbo engine develops more than ample low-end torque to get this near 3000-lb. (1360-kg) car up and going. There’s more than ample acceleration, while the six-speed automatic gearbox shifts fast and downshifts instantly when gunning the throttle, absent of any form of lag. Handling is composed, flat and compliant, with stiff dampers that won’t hesitate one minute to show you how rock-solid the entire shell is the moment you hit a pothole. The Cooper S can be set to three distinct drive modes, Sport, Medium and Green, each giving the car completely different characteristics. In Green mode, the car’s throttle is less sensitive, the steering wheel softens, and the transmission upshifts to save fuel. That’s how I managed to pull a reasonable average of 8.2 L/100 km while I had mine. In Sport mode, the car wakes up. The exhaust note gets louder (and synthesized), with occasional and rather comical exhaust farts coming out the back, sounding more like popcorn cooking in the trunk. The steering wheel gets heavier, and the throttle becomes super sensitive. Pull the gear lever towards you, and the gearbox holds onto revs longer, with prompt downshifts upon deceleration. It all makes for a coherent package that encourages spirited driving. Then, there’s the overall seating position. It’s comfortable and roomy, with ample leg and head room. The entire gauge pod is simple, and moves with the steering wheel as you adjust it. And the entire theme is fun, young, and hip thanks to ambient lighting that changes colours depending on drive modes, and an infotainment system that’s lodged within a giant circular hub. Speaking of infotainment systems, this one is superb, looks dashing, and is a breeze to operate through either the BMW-iDrive-style knob, or your own fingers on the screen. This is by far one of the best-looking, comprehensive navigation systems I’ve sampled, with real-live traffic as well! MINI says its vehicles are for individuals who want to set themselves apart, people who refuse to settle for conformity. And that’s fine, I mean, that’s great, because look at the thing! 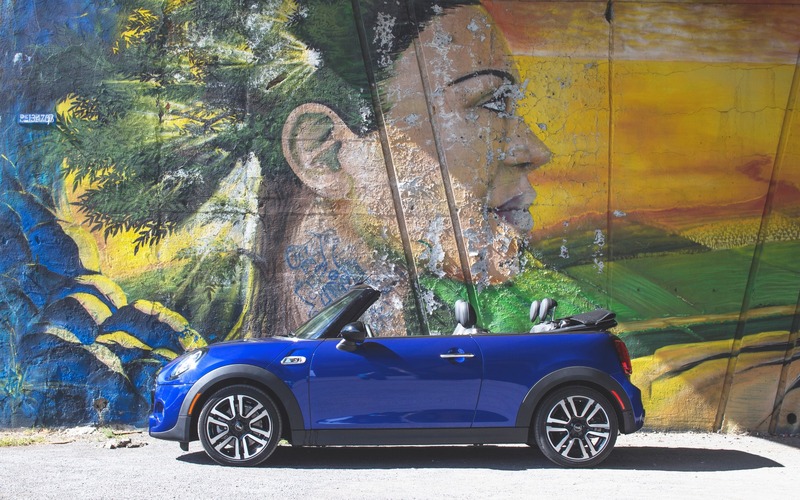 The MINI Convertible is cute, fun, and encourages you to get in and drive it. But it remains expensive, considering what you’re getting. It is, after all, a subcompact car, and that soft top makes the cockpit loud on the highway. Then, there’s the tiny itty little trunk that could barely fit my suitcase. And don’t get me started on rear legroom, because there is none. 6/10	We recorded an average of 8.2 L/100 km. For a car this size, that's decent, but we expected it to do better. 7/10	As long as you sit up front, you'll love this car, as rear legroom is very tight. 8/10	Respectfully quick and more than satisfactory handling. 9/10	Among one of the best out there. Fun, easy to comprehend and intuitive to use. Still not Android Auto compatible. 10/10	Everything about the MINI Cooper S was designed to be fun to drive, and the car doesn't disappoint! 8/10	The 2019 MINI Cooper S convertible remains faithful to the MINI formula all while keeping up with modern times. While expensive, it's an absolutely adorable little car to spend some time in.